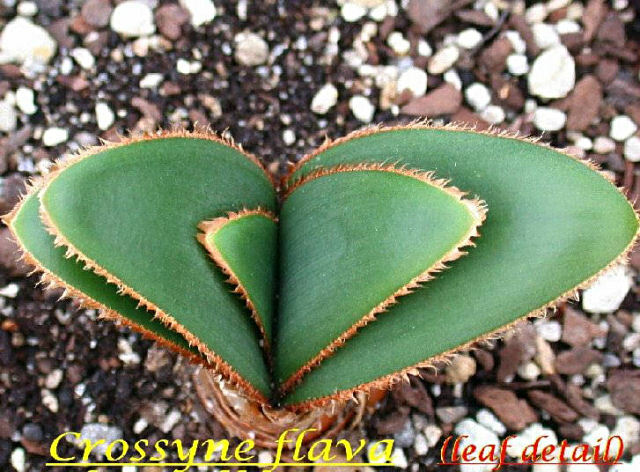 Crossyne is a newer name for a two species of bulbs in the Amaryllidaceae family from the winter rainfall area of South Africa that were previously thought to be species of Boophone. They differ from that genus in capsules and seeds. 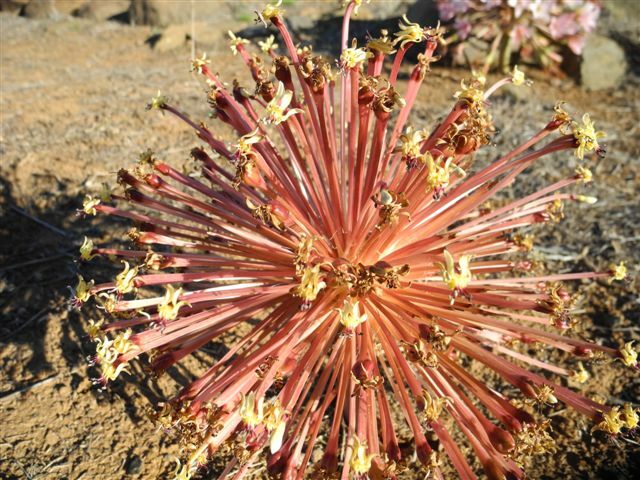 Crossyne species have many small flowers in each inflorescence and when the fruiting heads break loose, they tumble in the wind. Crossyne flava syn. 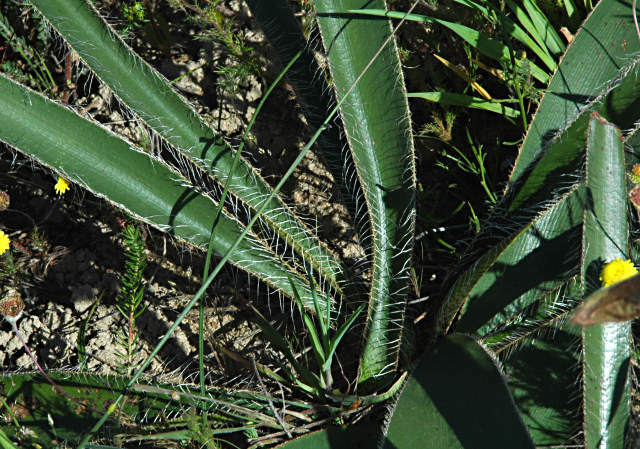 Boophone flava has strap-shaped leaves fringed with long, white or straw-colored bristles, with small, angular, red speckles beneath. It can have as many as 200 small pale yellow flowers radiating on pale lemon to pink pedicels. 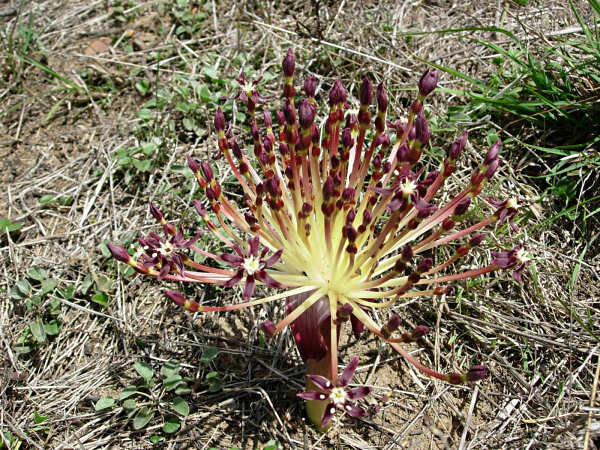 It is found on shale flats and rocky slopes in the northwest Cape. It blooms in the fall, before the leaves appear. 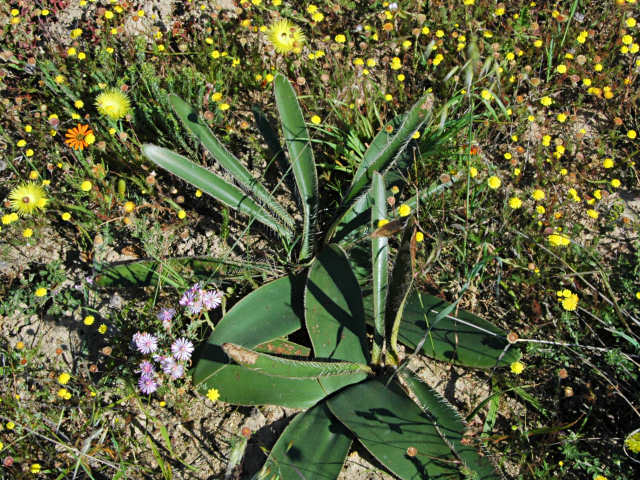 The first photo by Bill Dijk shows the leaves of a plant in cultivation and the next photo from Mary Sue Ittner shows the leaves on plants growing near Nieuwoudtville. 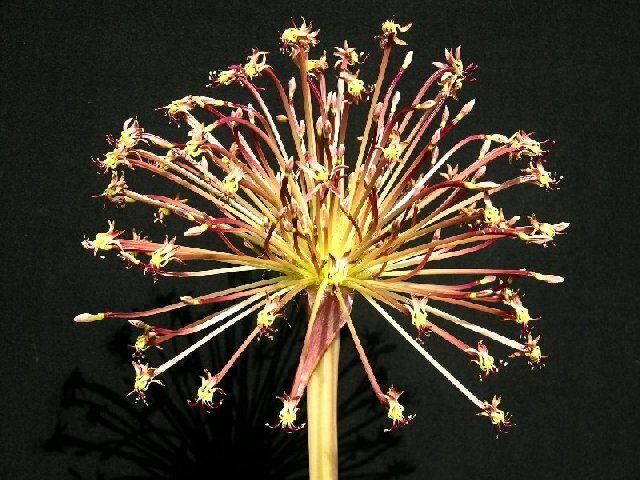 Illustrated in the third and fourth photos by Bill Dijk, the flowers are small but many in the flowerhead, with tepals much recurved on long pedicels. 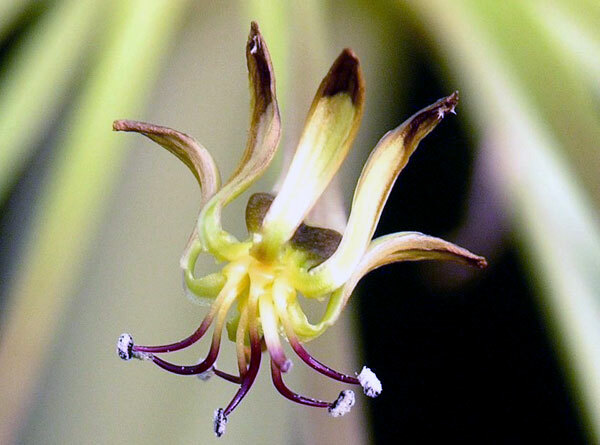 Flowers are yellow with brown tips and maroon filaments. 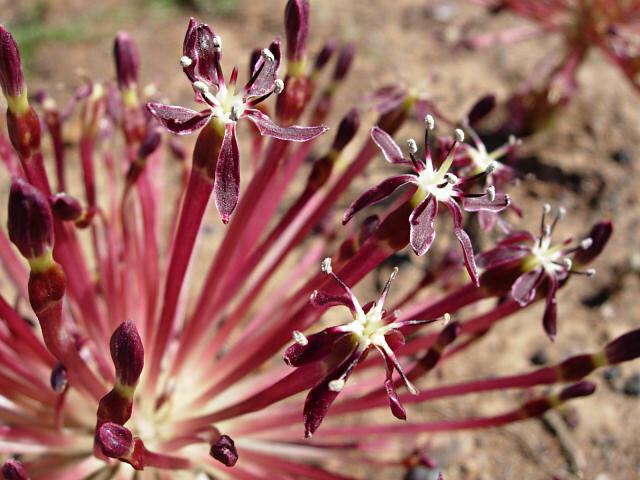 The fifth photo was taken by Rachel Saunders of the inflorescence of a flower blooming in habitat. 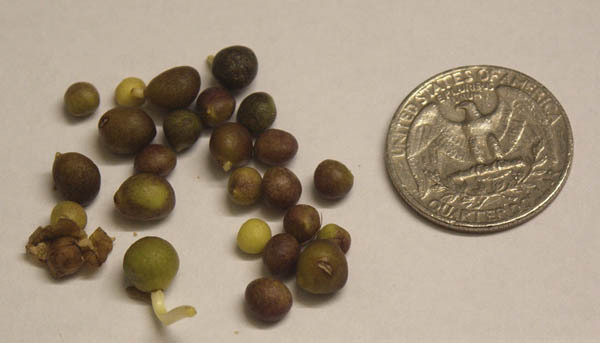 The last photo by Jacob Uluwehi Knecht shows seeds next to a U.S. 25 cent piece (2.5 cm wide). Crossyne guttata is a species found on shale and granite flats and lower slopes in the the western and southern Cape, South Africa. Like Crossyne flava, the leaves have hairy leaf margins. 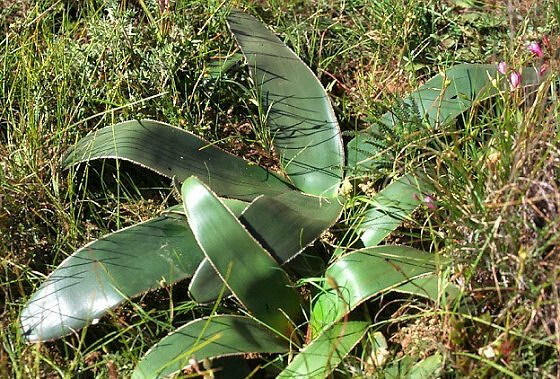 The leaves, absent at flowering, are smooth and leathery with maroon spots underneath in addition to the coarsely bristled maroon margins. There are as many as 200 small maroon or dusky pink flowers with the petals curling back and soon turning brown formed on rigid radiating pedicels. 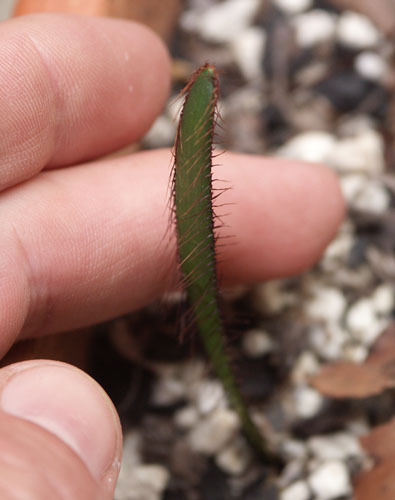 The first photo is of a seedling in cultivation, by Jacob Uluwehi Knecht The hairs are quite prominent even on seedlings. 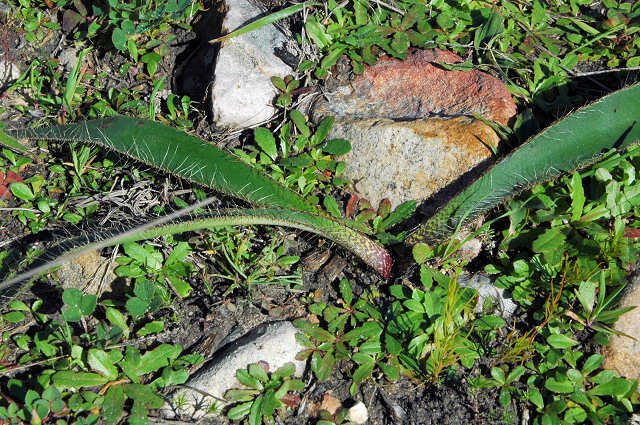 The next three photos from Mary Sue Ittner show the leaves of this plant in the wild, first near Tulbagh and the next two near Darling. 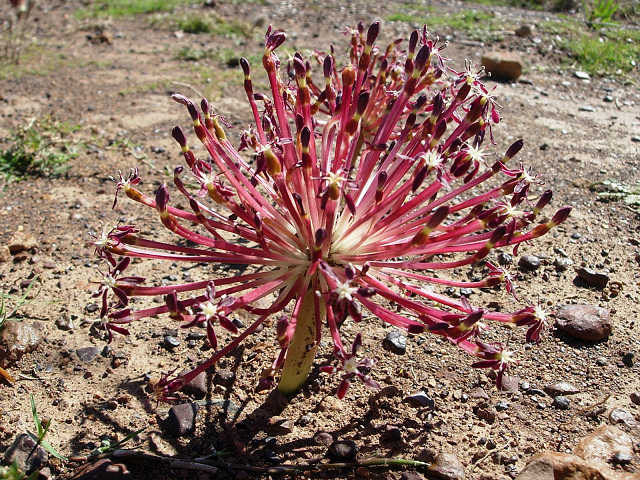 Photos of the plant and flowers taken in the Overberg near Caledon and Napier by Cameron McMaster.